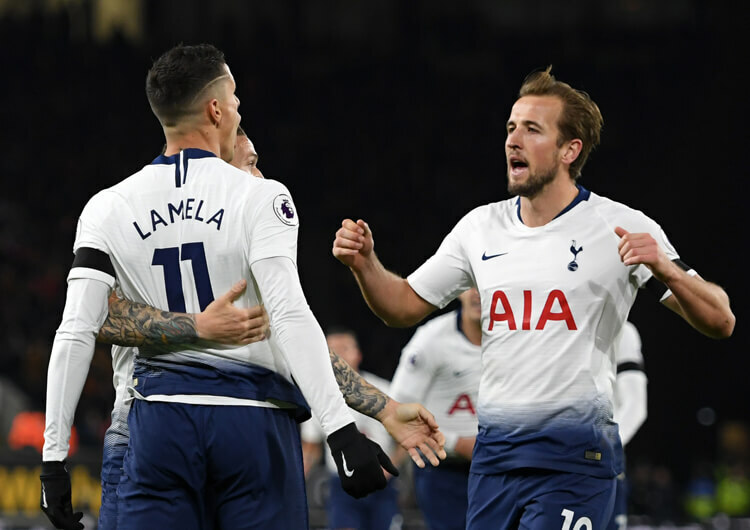 A superb Tottenham Hotspur display at Wembley was enough to inflict a first Premier League defeat of the season on Maurizio Sarri and Chelsea, and lift Spurs above their London rivals into third place in the table. Mauricio Pochettino’s side dominated throughout, and took an early lead when Dele Alli’s flicked header from a Christian Eriksen free-kick beat Kepa Arrizabalaga in the Chelsea goal. A long-range strike from Harry Kane surprised the unsighted visiting goalkeeper for the second less than 10 minutes later, with the rout completed by a superb individual effort from Son Heung-min early in the second half. A late Olivier Giroud header was little more than consolation for a Chelsea team well beaten on the day. Mauricio Pochettino sent his Tottenham side out with great intensity to pressurise the Chelsea back line, as the visitors tried to build from goalkeeper Kepa Arrizabalaga. From here, Spurs often regained the ball high and attacked Chelsea’s expanding structure. Early rotations between Dele Alli, Harry Kane and Son Heung-min created passing lanes between Chelsea’s lines, enabling Tottenham to work the ball into dangerous areas. 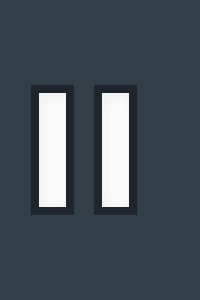 They took an early lead, as Alli’s flicked header from a Christian Eriksen free-kick flew through Kepa’s hands. Tottenham’s narrow central midfield unit dominated both in and out of possession. With the ball, they overloaded Chelsea’s central midfield trio, which allowed both full-backs to step higher and join the attack. 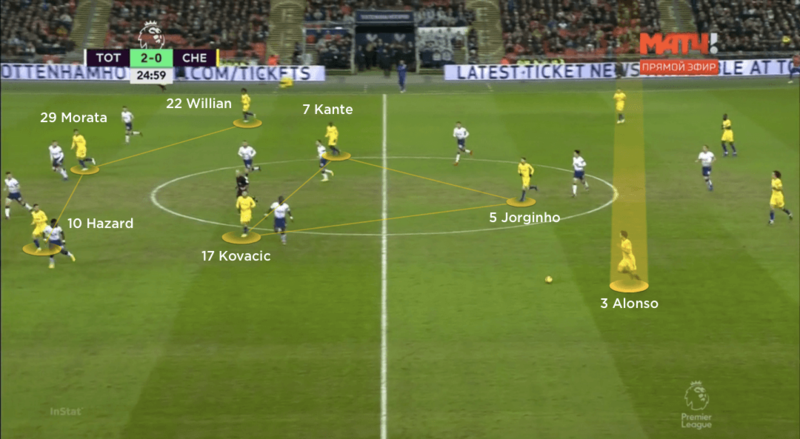 This gave them multiple central passing options to split Chelsea’s midfield unit or the potential to combine in wide areas and cross for Kane or midfield runners to attack. 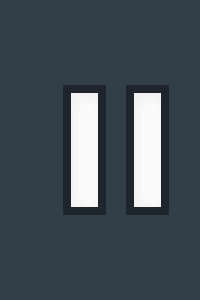 The hosts were also a threat during moments of transition. With Chelsea’s structure increasingly separating to avoid the congested central lane, Spurs were afforded more gaps through which to penetrate – especially as Kane, Alli and Son continued to rotate who dropped short and who ran in behind. Consistent changes of individual roles made it impossible for Chelsea to predict Tottenham’s patterns of play. A Tottenham second came as no surprise, as Kane’s shot from distance flew past David Luiz, who appeared to turn his back on it, and beyond the unsighted Kepa. The home side adopted a more defensive approach in the second half, looking to draw Chelsea forward and use Son’s pace on the break. With Kane dropping deeper and Alli continuing to man-mark Jorginho, Spurs were more than happy without the ball. Son’s curved runs around the sides of Chelsea’s defence as Tottenham regained possession helped isolate Jorginho in wide areas – and this is exactly how the hosts’ third came about. Son’s pace was too much for Jorginho, but Luiz’s attempt to tackle him as he entered the penalty area was woeful. The Korean’s cool finish under Kepa ended the game as a contest with more than half an hour to go. Spurs maintained their diamond 4-4-2 formation when defending, with Kane and Son in front of Jorginho but crucially on the angle from the Italian. This blocked his access back into his splitting centre-backs, with Alli firmly pressing from behind. This meant Jorginho struggled to link defence to midfield through Maurizio Sarri’s trademark third-man passing combinations. As the single pivot had minimal options to set, Chelsea struggled to get the third man in any position for the crucial third pass. As Chelsea eventually settled on the ball, Tottenham dropped into a mid-block.  They remained in their diamond, trying to force play away from the central lane. 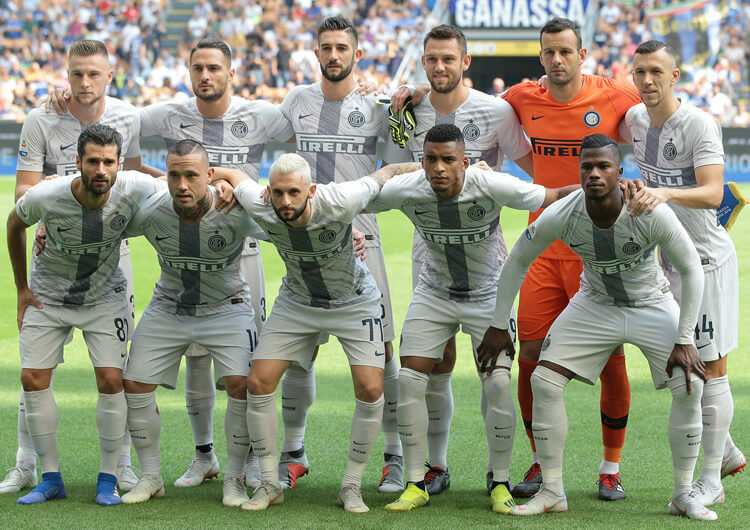 With the visitors insistent on building from a central base, however, the hosts enjoyed a huge amount of defensive success from the work of Moussa Sissoko, whose ability to block passes, regain the ball and set-up counter attacks was reminiscent of his midfield rival for the day, N’Golo Kante. Tottenham’s early dominance came from their overload in the central channel. Harry Kane dragged either Chelsea centre-back into the wide areas, increasing the gaps for both Dele Alli and Son Heung-min to exploit. Spurs maintained their diamond 4-4-2 formation when defending. They prioritised blocking the central lane, with an emphasis on stopping Jorginho linking Chelsea’s units together. As the second half progressed, Tottenham dropped deeper into a very compact mid-block. Positioning their entire outfield unit to block the central lane forced Chelsea to try and play over or around them. Chelsea’s central midfield was consistently overloaded. Further forward, Eden Hazard and Willian also moved infield to create space for the full-backs to step forward – but they rarely did, worried about leaving Tottenham two against two on their centre-backs. Chelsea’s pressing intensity increased in the second half, but they lacked compactness. N’Golo Kante followed Eric Dier deep into Tottenham’s half, creating more space between the lines for Spurs to progress the ball forwards. Chelsea’s full-backs moved higher in the second half, as they chased the game. This left Jorginho to drop into the back line, where he had to deal with the pace of Son during moments of transition – this did not end well in the build-up to Tottenham’s third goal. 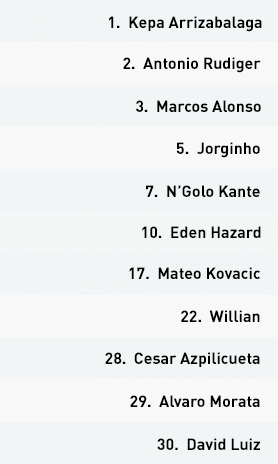 Maurizio Sarri set his Chelsea team up in their familiar 4-3-3 formation, with Jorginho operating as a lone pivot behind fellow midfielders N’Golo Kante and Mateo Kovacic. But with pressure mounting on their back line in the opening exchanges, they looked for lone forward Alvaro Morata with direct long balls. Morata drifted across towards the wide area, hoping to link with his teammate on that side, after winning the first contact. From here, Chelsea could penetrate into Tottenham’s half – but they failed to create quality openings as Spurs were too often quicker to the second ball. As they eventually enjoyed more consistent possession, the visitors remained insistent on building and attacking through the central lane. Even when up against Tottenham’s congested central midfield diamond, both wingers – Willian and Eden Hazard – repeatedly cut inside with the ball, or moved inside to receive vertical passes. Even with that pair’s quick feet, though, space was too tight for Chelsea to consistently progress the ball forward. They found some success when forcing Tottenham to restart with longer balls, as Hazard and co could then find more central space on the break – but Morata’s lack of awareness and smart movement from the home defence resulted in a succession of offside calls that broke any Chelsea momentum. 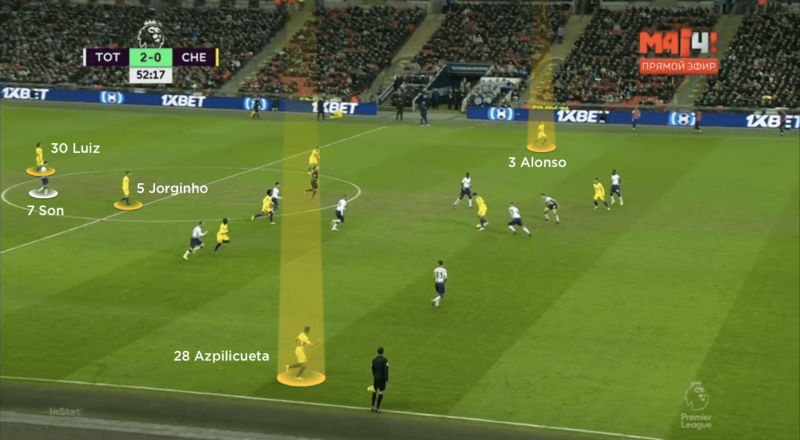 In the second half, the visitors used more direct play – this helped avoid the congested central lane, with Willian in particular making effective blind-side runs across the Tottenham back line. At 2-0 down, they also pushed both full-backs forward in an attempt to horizontally stretch the hosts’ defence – but this left them exposed to the type of counter-attack from which Spurs scored their third. Having replaced Morata and Kovacic with Ross Barkley and Pedro, and moved Hazard into a central attacking role, Chelsea ended their direct approach and instead looked to build with short passes into midfield. From here, they were reasonably successful in moving the ball into the final third, but with Kante as a late runner to support Pedro and Hazard as they combined from the right, moves often broke down. The French World Cup winner is defensively superb but perhaps not suited to the role he currently has in this team – something that may continue to trouble Sarri, whose side got one back from the head of substitute Olivier Giroud late on. Chelsea’s defensive press, particularly from midfield, was disorganised and lacked any form of aggression. 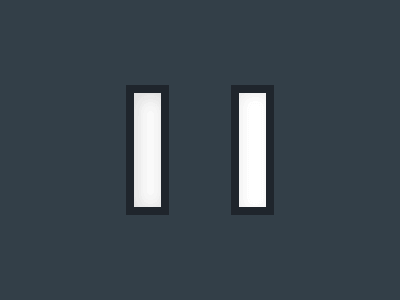 They lacked numbers when pressing high, as the distance between their units was too great. The hosts were able to use chipped passes over various units, with Son Heung-min and Dele Alli repeatedly penetrating in behind with well-timed forward runs. 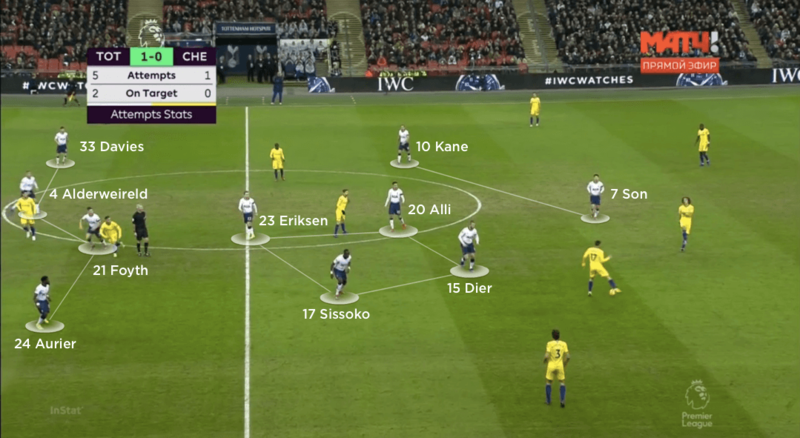 Even when they did manage to regain possession, they struggled on the counter, with Tottenham’s double pivot of Moussa Sissoko and Eric Dier blocking immediate access into the Chelsea front line. This only got harder as the hosts went two goals up and dropped their full-backs into more reserved positions. The away side eventually found some form of success by starting much higher during Tottenham’s goal-kicks. 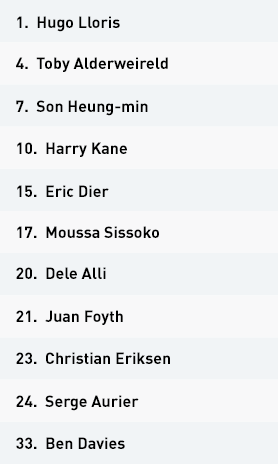 From here, Hugo Lloris was forced into longer deliveries, with Dier and Sissoko – Tottenham’s two strongest midfielder ball-winners – into more advanced positions. 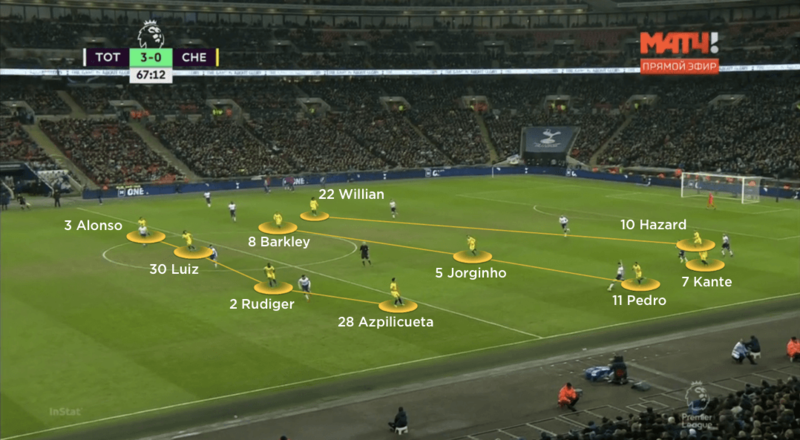 Should the Chelsea back line win the first contact, Hazard and Willian finally had central space to attack; a resulting low drive from the latter was the best effort they mustered to that point. In the second period, Chelsea’s intensity increased – as did their successful regains of the ball, particularly from Kante. However, Spurs dropped into a deeper mid-block than in the first half, meaning Chelsea’s defence was most required during moments of transition. 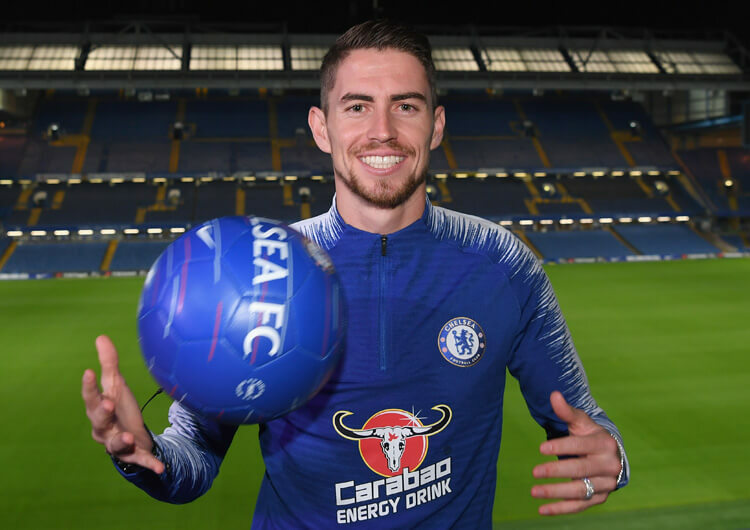 With both full-backs pushed higher to help build around the congested central lane, Jorginho – marked superbly by Alli – was left to drop into the back line alongside David Luiz and Antonio Rudiger. This strategy did make sense, but it collapsed as Son’s devastating burst of pace exposed Jorginho down the right channel and led to the goal that effectively killed the game.